Males of sexually cannibalistic species are thought to express behaviors that reduce the risk of being killed by the females. In several spider species the male modulates his approach to the female as a function of her feeding behavior. We tested this hypothesis in the preying mantid Mantis religiosa (L.). Males were placed behind perching females in a laboratory arena and their position was video-recorded. Females were presented with a prey item (prey-presentation period) and then either they were allowed to capture and eat the prey (“P” treatment), or the prey was removed before the female could capture it (“NP” treatment). For the next 10 min (between-prey-presentation period) the females ate the prey (P), or perched without moving (NP). Total speed of approach of males was over 6-times higher in the P treatment (2.3 cm/min) than in the NP treatment (0.4 cm/min). Speed in the prey-presentation period was higher in P than in NP (4.4 cm/min and 1.3 cm/min, respectively), which shows that seeing a female striking and/or grasping the prey in itself stimulated faster male approach. Approach speed in the between-prey presentation period was also higher in P than in NP (1.9 cm/min and 0.2 cm/min, respectively), which indicates that seeing a female feeding on the prey and/or cleaning her forelegs also stimulates male approach. We conclude that males of M. religiosa can assess the activity state of the females and respond to this information by modulating their speed of approach, probably reducing the risk of being detected and possibly cannibalized. 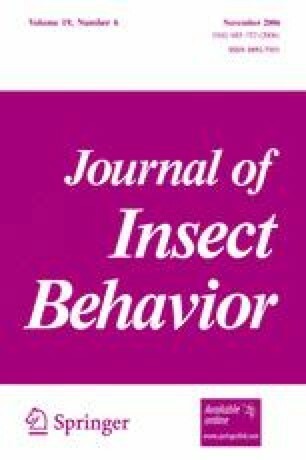 We thank F. Fabritius, N. Fabritius and J. Dasca for collecting mantids, R. Vaquera for technical help, D. Casado for his helpful observations during the early stages of the study, and M. Maxwell and J. Moya-Laraño for discussion of an early version of the manuscript. This research is funded in part by a Ramón y Cajal grant from the MCYT of Spain to C.G.